The seven colors of the Rainbow are used to represent seven teachings that each member receives on her journey toward the pot of gold. William Mark Sexson, a Christian minister and active member of the Masonic Lodge, founded the International Order of the Rainbow for Girls in 1922. The Rev. Sexson had spent his life dedicated to both fraternal organizations, and his ministry, and became aware of the need for a youth organization for young women who were from a Masonic or Eastern Star home. Many jurisdictions also offer Pledge groups for younger girls who wish to join Rainbow when they turn 11. The age range for Pledges is usually 8-10 year olds, though some jurisdictions allow younger girls to join Pledge groups. Check with your local jurisdiction for specifics about their Pledge program. Petition an assembly for membership (Parents or guardians must approve of membership). California – Jill Kinmont, A world-class (Olympic) skier who was paralyzed in a skiing accident. After her accident she became an inspirational speaker, wrote a book that is used by many schools, started her own foundation, the Jill Kinmont Indian Education Foundation. There is a movie about her life – The Other Side of the Mountain. Nevada – Dawn Wells, Miss Nevada, “Mary Ann” on Gilligans Island, TV journalist and hostess. Has special line of clothing “The Wishing Well”, using velcro closures for those who have difficulty dressing themselves. Advisory Board Childrens Hospital at the University of Missouri, Co-hosts the Children’s Miracle Network Telethon for Missouri for over 11 years, Board of Trustees at Stephens College. Spokesperson for the International Wildlife Coalition and The Elephant Sancturary. Instrumental in establishing the Whale Sanctuary in Antarctica. Janell Berte’ is a PGWA from Pennsylvania. She is in her mid to late twenties and already a VERY successful business woman and bridal gown designer. Senator Daniel Inouye and for the Dept of State, and Sao Paulo Brazil. Even though I do not know of any members of the group I am still interested in becoming a part of this group. i would contact the other juristiction’s leader-older lady. I was LEWSIBURG ASSEMBLY’S (pa RAINBOW) AND WHEN TO RHODE ISLAND BEFORE I HAD MAJORITY IN 2001. I AM TRYING to figure out who now designs the dresses for the girls since i know it is not Ms. Berte for sometime. I will contact Heather P for this. I am a rainbow girl in Illinois and I am a Grand Rep to West Virginia. I haven’t received any information and I needed to know if someone could help me by finding out the Grand Worthy Advisor’s, or any person who could help me, contact information. It would be very much appreciate it. Please and thank you. I am a rainbow girl in Colorado and Grand Representative to Hawaii. I recieved no contact information for my counterpart, and can’t find information on Hawaii’s IORG anywhere else. It is almost our Grand Assembly, it’s this weekend, and I need this information as soon as possible. Any help? Please and thank you. For Deidre Davis- I’ve noticed you have made several posts wanting information about Rainbow. I am not sure where you live, but if you will use this website: http://www.gorainbow.org and use the maps to find an Assembly close to you, I promise you those sites are monitored by Supreme and Grand Levels. I am a Mother Advisor to an Assembly in St. Joseph, Missouri and when I was having some computer issues, I got a phone call from those in my state monitoring the website to tell me that I had a website contact. Please let me know if you reach anyone- I really hope you become a Rainbow Girl!!! You can reach me through the website as well! Rainbow Love, Mrs. Schubert. I am looking for the words and music to “Only A Rose.” Can anyone help? I am extremely intersted in joining this group. I am fourteen years old and my grandfather is a free mason. My Jewish friend, Olive, told me about this group so I went online and found this site. Please email me any details. (p.s. I fit all the requirements) Thank you, all. Can anyone tell me what assembly Sandra Day O’Conner belong to? 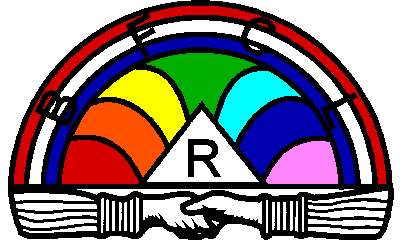 I’m not sure where masonry/eastern star/rainbow girls are being confused for a religion. I have read the story you’re referring to. However, you don’t even have to be a Christian to join any of them. They just require you to believe in a supreme being. I’m not a part of any of these organizations, but I do know quite a few people who are, and let me say, they are amazing people. I watched them spend nearly 2 days delivering food and gifts at Christmas to families who otherwise had nothing, I’ve seen them reach deep in there pockets to pay for medicine when a parent couldn’t pay for it, or use their personal vehicle to drive 6 hrs, one way, taking a child to their Dr’s appointment for nothing more than to know they helped someone. So I strongly urge you to look at all the good these organizations do it a time of such disparity.